Cancellations or modification needed 72 hours before arrival date. 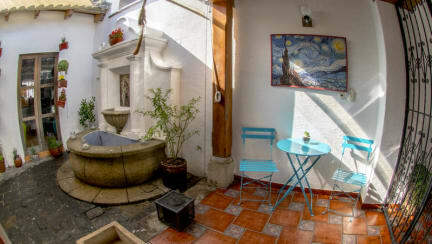 Luna Maya Hostel & Wellness welcomes you to our unique Boutique Hostel and Wellness Centre in Antigua Guatemala. We offer a relaxing style of travel; our goal is to provide a cosy and tranquil atmosphere to make you feel at home, nurturing your soul while you are traveling and experiencing Antigua´s wonderful sites. We have three shared rooms; we believe in comfort, free Wi-Fi and lockers. Inside our facilities, you will find our mindfulness yoga studio offering a variety of classes throughout the day and evening; we also have the best Coffeehouse in Antigua where you can delight yourself with the best coffee in town. We are located just in front of Cafe No Se and two blocks from San Francisco Church. The Hostel is 1 hour and 30 minutes from La Aurora Airport by taxi or bus. We have three shared rooms with bunk beds, one room have three bunk beds and is equipped with special items for woman, and the other two rooms, one with two bunk beds and the other one with three bunk beds are mix rooms. I live for several months a year in Guatemala, and Antigua tends to be a travel hub for me. Luna Maya again this year was my place to stay for a night or three while making connections. 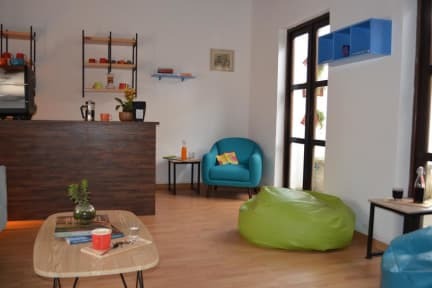 It is a very comfortable and well-maintained hostel. There are several good places to eat nearby, and it is convenient for walking around the lovely city of Antigua. I will definitely stay there when I return next fall. Few minutes walk from Parque Central and countless eateries. Simple but sufficient breakfast - granola fruits toast jam coffee. I would add yogurt though. Drinking water provided. Yoga & meditation classes on site. Tranquil and quiet atmosphere, perfect for taking a break from busy & exhausting travel days. Dorms are very clean, bed super comfy. But water pressure in female dorm is not good. Will stay here again. Absolutely loved this hostel. Stayed in the doorms. Super comfortable big beds, beautiful curtains for privacy. Simple and good breakfast (granola, fruits, toast, jam, coffee). Wifi is weak in the doorms, common area is a bit small but it’s ok as there are not many people. Not much of an atmosphere, good for good night sleep. Toilet system had some problems but showers were clean and well equipped. No kitchen but the staff let me put some stuff in their fridge. Best location in town!!! Really nice and clean place, perfect if you are looking to relax and rest. I think I never slept in such a comfortable bed during my whole trip in Central America! The breakfast is included in the price and is very good! Unfortunately, staff doesn't speak very good english. Very peaceful place to stay! Great location, quiet but not too far to the center! A nice simple place . It's not a party hostel so perfect for a chill . The staff were nice especially the young guy working in the afternoon . He helped me when I was looking for a charger as mine broke. And when I had questions he helped me. I would recommend . Quiet, pretty hostel, good breakfast, and great location -- more for older travellers. Staff are reserved, not very friendly or helpful, and don't have any info about tours etc. Stayed for 2 nights before doing the Volcano hike and really enjoyed the extremely comfy bed.The breakfast is nice and the location is great. Absloutely no atmosphere but on this occasion that's what I wanted for a rest! This would have been a much better review had I not come away feeling ripped off. I came back for one night after the hike and had to pay 30Q more as apparently "it's more expensive on a Monday"!?! Even though it was still advertised as 80Q on Hostelworld I now had to pay 110Q.